WooCommerce is a free plugin for WordPress which “now powers over 30% of all online stores with over 1M+ downloads.” It has fast become the best solution for quickly and easily setting up your own online store to sell any type of product. The great thing about WooCommerce being free and open source is that there are no on-going fees for running your store, all you need is a free copy of WordPress, a Free copy of WooCommerce, hosting for your site and a WooCommerce theme. WooCommerce will let you create just about any type of eCommerce website that you need to, you can sell physical products or digital downloads. There are a whole host of hundreds of extra plugins you can also install which will add even more functionality. WooCommerce themes are what we are looking at in this collection, we have gathered together over 50 different themes for many types of online stores – all the themes on this list are attractively design with modern layouts, fast-loading, offer lots of customization options so you can change the colors and add your own logos and other images to really match it to your company’s branding. 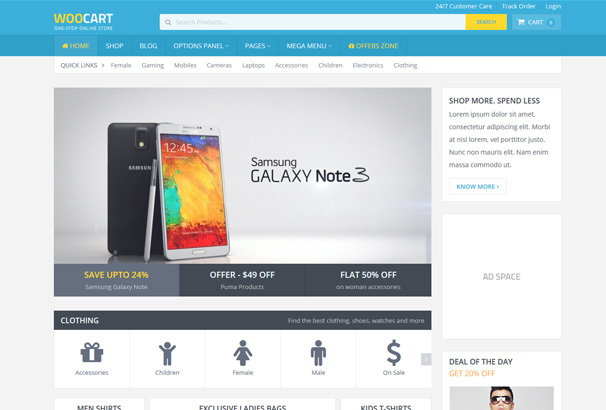 WooCart is the perfect theme for all the people that want to create a fully functional online store. Using this highly professional theme you get to sell your products and gain profits in a really appealing way. Its sleek and structured design helps you create a really fantastic website for whatever products you’re selling. This particular website theme has a really exquisite design. 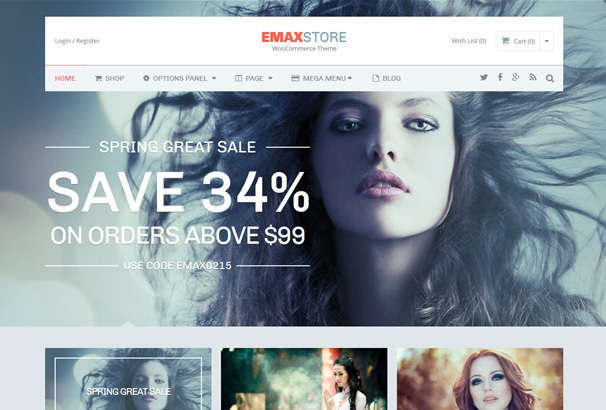 An e-commerce theme that serves multiple purposes, eMax Store has a really beautiful and contemporary design that helps you create a really modern and attractive online store. Guaranteed to help you sell more products and bring in greater profits, eMax Store has the ability to be a standalone blog or even be a part of a larger, more established e-commerce website. 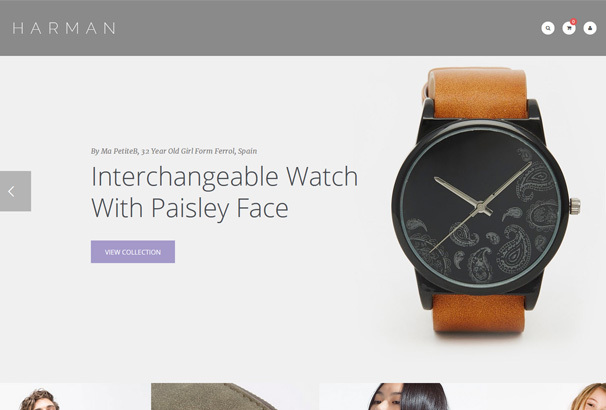 Hudson is a super contemporary and cool website theme for WordPress. With its modern and minimalist design, Hudson comes with a lot of features and lets you create a really organized and appealing website for your brand. This website theme also has WooCommerce integration and lets you build your very own online store for your brand in very little time without having to do any of the work. 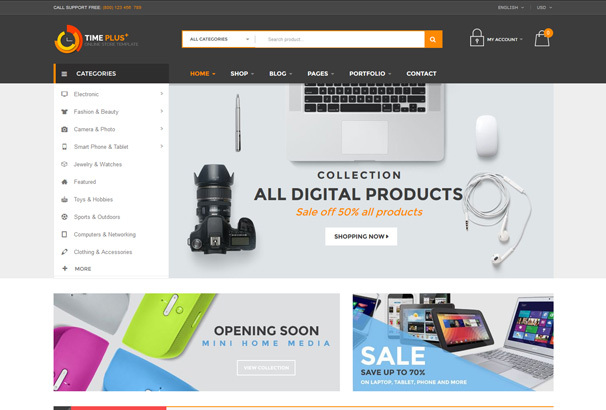 Flever is a really amazing e-commerce website theme. With its impeccable design, Flevr helps you gather a huge audience for yourself and your brand promising higher sales and profits. Powered by WooCommerce, this website theme lets you put your own spin on a custom made website without even touching a single line of code. It is guaranteed that once you use this theme, you will not even think of using another. 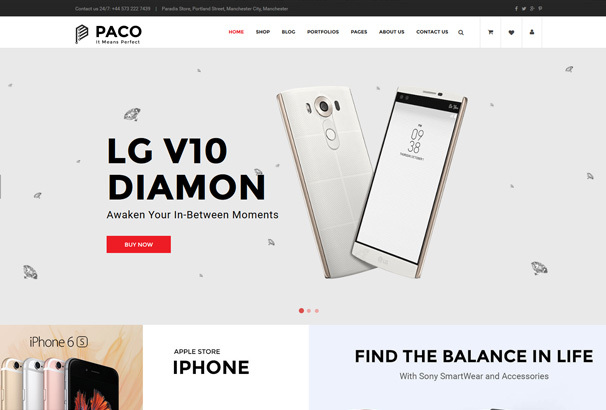 SW Paco is a super-responsive website theme that is perfect for all the online stores dedicated to selling electronics and gadgets. With its two homepage designs you get to choose which one you like best according to your brand and your content. In addition to that you get to customize your website and create categories, add product details and enjoy the high speed and efficiency of the custom checkout, cart and product details options. 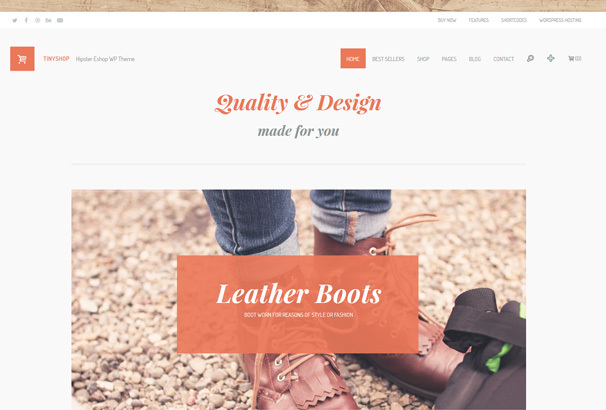 This website theme with its e-commerce pages meets all your online store needs. eCommerce is a really minimal and modern website theme that goes perfectly with all sorts of product. The best thing about its simplicity is that it creates a website that is appropriate for whatever product you’re selling. eCommerce has a lot of speed and efficiency and makes it really easy to make purchases adding to the appeal of your website. This really practical and professional theme promises to let you establish and run your store with ease and comfort. BiShop is a really responsive and contemporary website theme. Not only its chic design, BiShop also comes with amazing features including a quick-view product popup, a visual composer plugin worth $39 and three amazing and stylish homepage layouts. Not only that, BiShop also comes with a strong and powerful drag and drop builder using which you can combine elements and create your very own distinct website. 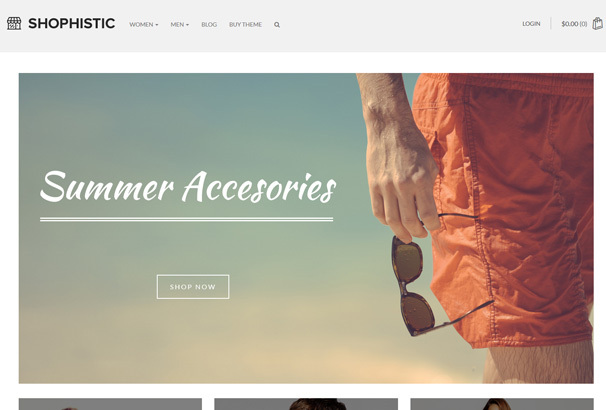 Perfect for creating an amazing online store, this theme with its WooCommerce integration is perfect for all brands and all sorts of products. Wilson & Smith is built on really cutting edge technology that makes it a really efficient and practical website. This e-commerce website helps you build your very own online store in a really simple and convenient way. 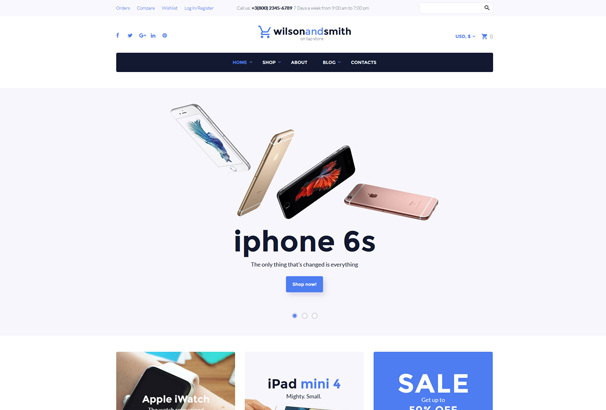 This website theme is perfect for all the people and businesses that deal in electronics. 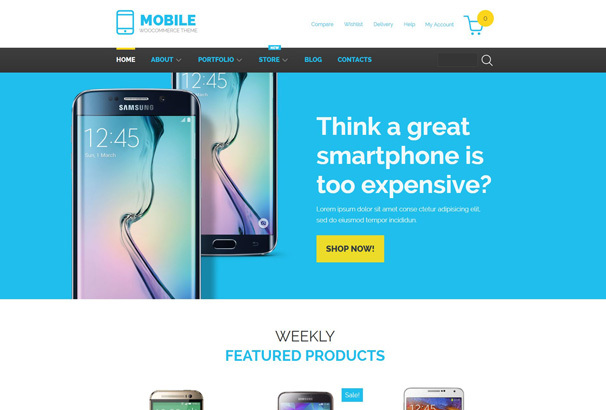 Whether you’re selling computers or smartphones, this website theme makes use of imagery and text to help you promote your products. With its WooCommerce integration this theme is perfect for all the people that want to run a successful store online. As made obvious from the name, Food Store is designed for online stores that deal with food. Whether you’re selling organic fruits and veggies, or you run a salad store online, this website theme is bound to be your holy grail. This theme comes with WooCommerce integration and is famous for its practicality. It also has a special product presentation section which includes things like ‘new arrivals’ and ‘popular products’. In addition to the text further information about the stores is easily conveyed through simple and easy to understand icons. Watches is one of the most stylish website themes that is designed to add to the elegance of your products. This really responsive website theme is built on the powerful mobile-first Bootstrap and the Cherry Framework 4, Watches has strong functionality. Although the options that come with this website are great, you can also turn these options off to minimize clutter. Not only that, Watches also comes with WooCommerce integration allowing you to run and establish your very own online store. Whether you want a website where you can share music or other media or want to create a website where you want to put downloadable content, Music is the theme for you. Although this theme is great for sharing as well, this theme was designed particularly to make sure that you sell your product and make the maximum amount of profits on your content. It has a really easy to use interface and has a really cool blend of typography and imagery. 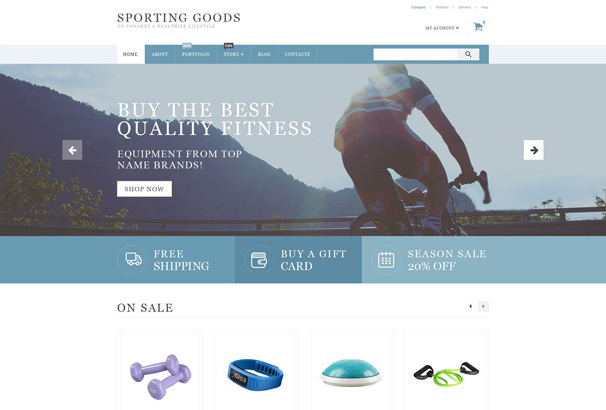 As the name suggests, Sporting Goods is a website theme particularly designed for you to sell sporting goods. Its design was created in a really creative and stylish way in order to attract the most attention towards your online store. In addition to that it also comes with a number of WooCommerce templates out of which you can pick your favourite. Using Sporting Goods you are bound to see an increase in your sales and profits. 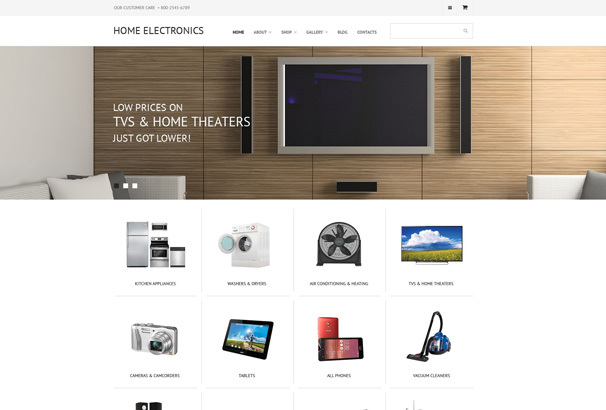 As one would assume from the name, this modern and contemporary website theme is particularly designed for selling and promoting home electronics and gadgets. With its WooCommerce integration this e-commerce website theme is designed to promote your products in a really stylish and attractive way. Its elegant design and efficient functionality is bound to bring in more sales and profits for you. Mobile is a really simple and direct website theme. Particularly designed for businesses and companies that deal with mobiles and smartphones, this theme has a really sleek and chic layout. In addition to the blue and yellow techy colour scheme, Mobile is also very efficient and functional adding to its appeal and professionalism. It comes with a full-width slider, a descriptions box and a shop-now button giving the ultimate shopping experience to the shoppers. Gameedion is a really creative and stylish website theme for WordPress. 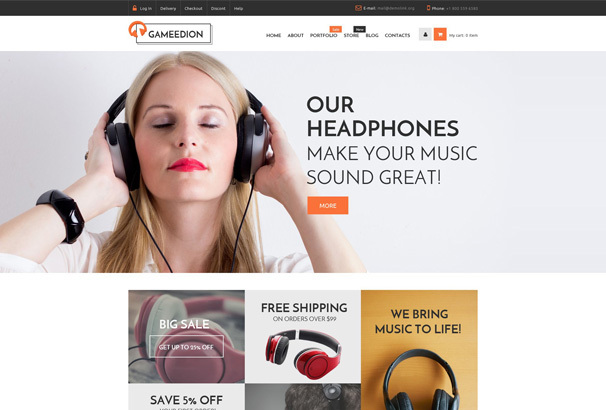 For all the companies and businesses that deal primarily with music distribution and sales, Gameedion is the perfect website theme. With a really funky and creative layout, this website theme is bound to attract a lot of attention. In addition to that this website theme has a really user friendly interface which is a must for websites with music based content. 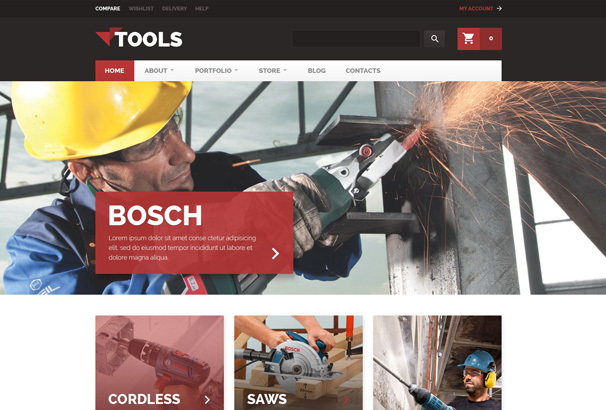 Tools is a really professional and creative website theme. Equipped with WooCommerce integration, Tools has a retina ready design that organizes all the content in a grid and presents it in one big block. In addition to the structure this theme has a really responsive design which engages the viewers in one full-width header slider. Tools and its degree of professionalism makes it one of the best e-commerce websites. 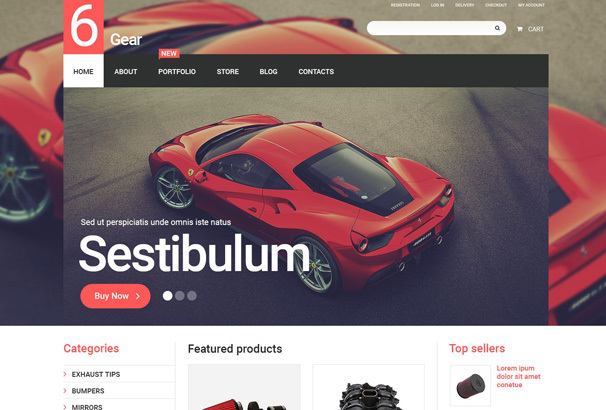 6 Gear is a really dynamic and versatile website theme. It has a really bold and gorgeous layout which highlights the imagery and headers in a really modern way. Its classic red and black colour scheme adds to its glamour. There’s a special social media block at the bottom of the page and a main header slider to highlight your products. Whether you’re a motor company or a business dealing with automobiles, this classy website theme is all you need. 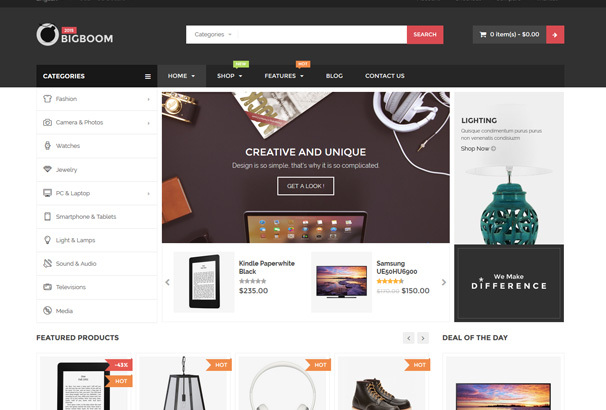 Beatshop is a highly multipurpose website theme with WooCommerce integration. Its contemporary design makes this stylish website a favourite among all. It has an inherently manly design and is most suitable for online stores that deal with men’s apparel or accessories. This powerful website theme has all the major features that are necessary for a really efficient and strong website. Time Plus is a really modern and stylish website theme. It has a super user friendly interface that makes navigation easy as well. In addition to its sleek design, Time Plus also comes with a lot of great features which let you build and run a really powerful and efficient online store. Built on the Bootstrap technology, this theme also has a defined admin panel to let you manage your website. An ideal for all sorts of products, Time Plus creates a really functional website. The Bear is a really strong and powerful website theme. It has a really responsive layout which is extremely customizable as well. Whatever the nature of your content, The Bear makes a really strong statement with its display and enhances the appeal of your brand. 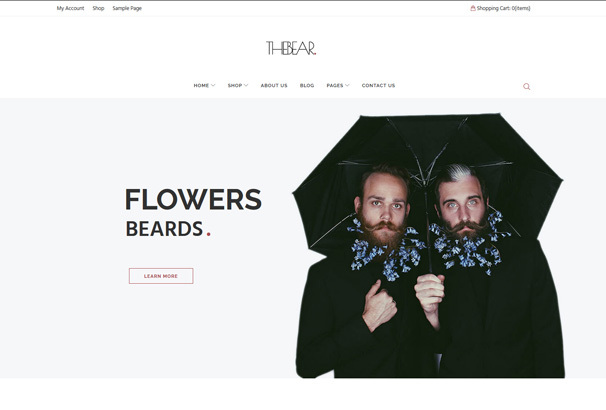 Perfect for portfolios, blogs, e-commerce websites and businesses, The Bear is a fantastic website theme. 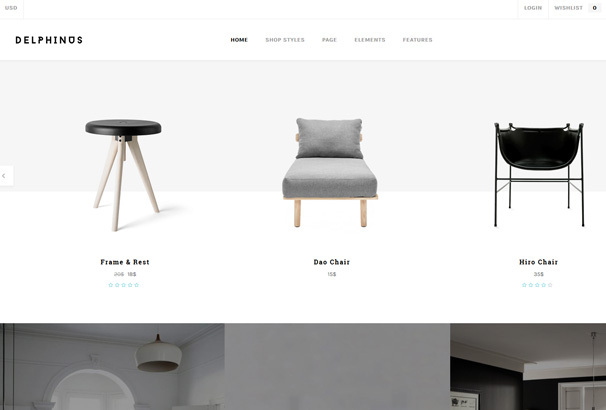 VG Fobe is a really simple and minimal website theme that is perfect for all the people that want a really efficient website without having to do any of the work. Highly customizable, this theme comes with WooCommerce integration and is perfect for establishing an online store for your brand. 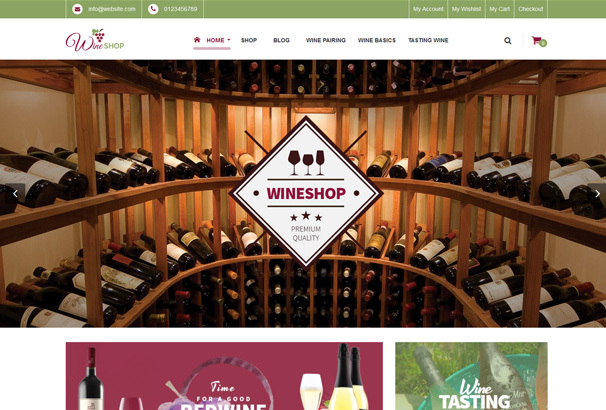 Its layout and imagery is perfect for wineries, bread stores and food stores in particular. Not only its design, VG Fobe has high professionalism that is seldom matched. 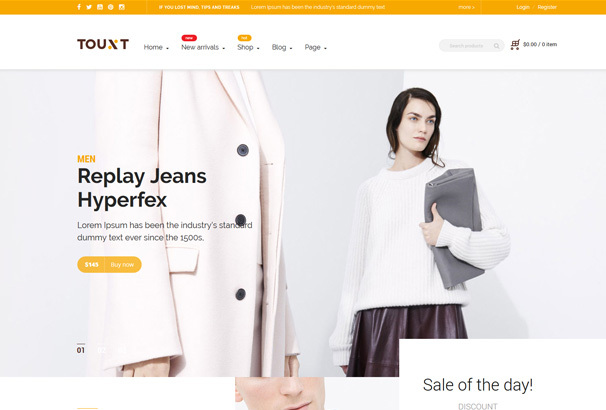 Touxt is a really versatile and dynamic website theme for WordPress. Whatever kind of online store that you want to build for yourself, Touxt does the job. This theme comes with a visual composer, a very extensive mega menu and a revolution slider making Touxt a really user-friendly and easy to use interface. This business website theme comes with WooCommerce integration and is a really efficient e-commerce website theme. VG Orion has four fantastic layouts with a different colour scheme for each layout. In addition to that it also has three theme box layouts. 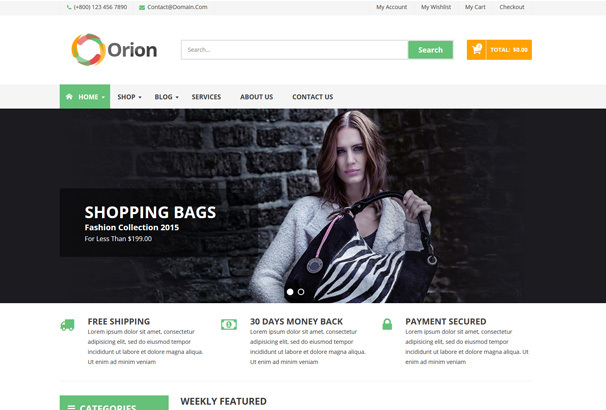 Whatever kind of online store you want to create and manage, this website theme with its trendy design and efficient functionality, is the ideal option. 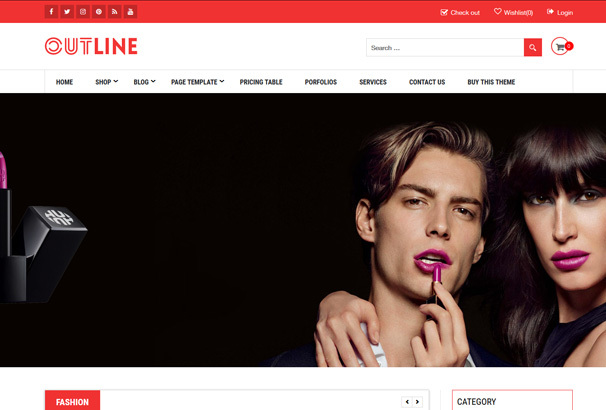 WD Outline is a really contemporary and chic website theme. 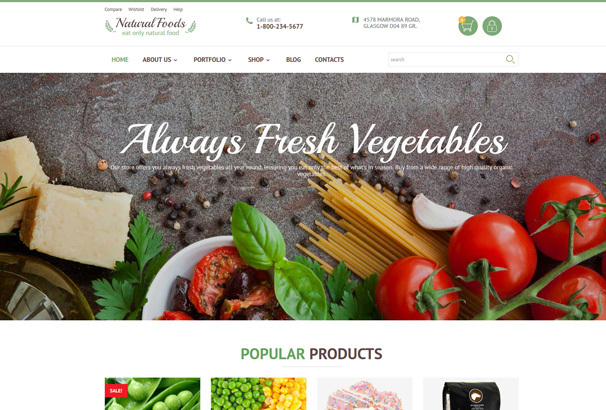 Whether you want to open an online grocery store, supermarket, cosmetics store or even an online shopping mall, this website theme with its extensive and structured layout is the thing for you. An e-commerce website that is not only very appealing but efficient as well, WD Outline is one of the most versatile themes we have. Lemon is a really versatile and dynamic website theme that goes with pretty much all sorts of content. Its trendy and chic design with the yellow and black colour scheme is guaranteed to attract an audience for your website. Lemon has a really flexible design and is easily customizable. On top of everything Lemon has a really fluid and easy functionality and runs really well on all devices. 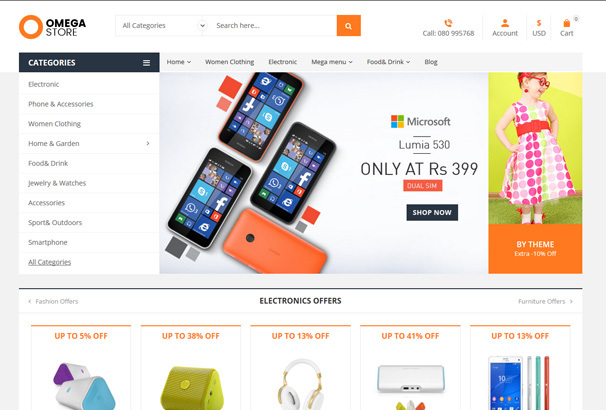 Kanta is just the sort of website theme that is highly multipurpose and can be used for any kind of online store. Whatever you’re selling or promoting, whether it is services or products, Kanta is the theme for you. It has a really elegant and simple design. Not only the template, Kanta is super-fast and helps you create a really organized store for your brand. With its promise to give the ultimate shopping experience, this multipurpose theme is good for anything. 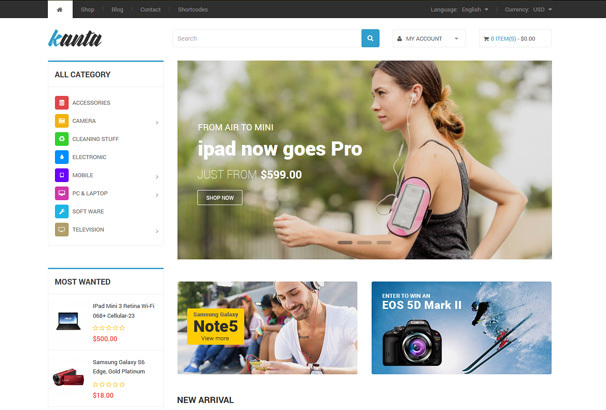 Harman is a WooCommerce integrated e-commerce website theme with a really simple and elegant design. Perfect for all sorts of online stores particularly watch or accessory stores, Harman is a really versatile theme. Its sleek design and efficient functionality makes Harman a favourite among all that value speed and efficiency. 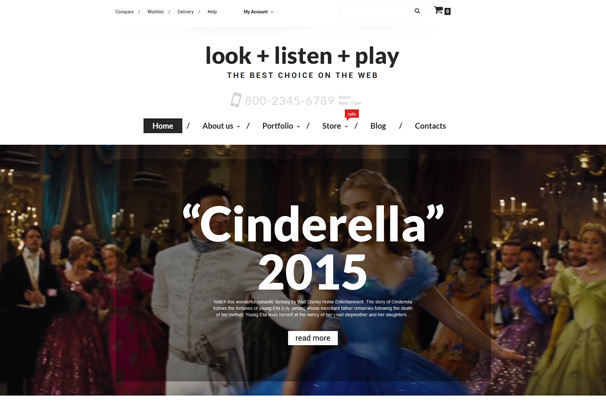 Ara is a really powerful and strong website theme that makes a statement with its layout. User-friendly and easy to use, Ara is a WooCommerce integrated website that is perfect for all sorts of online stores. 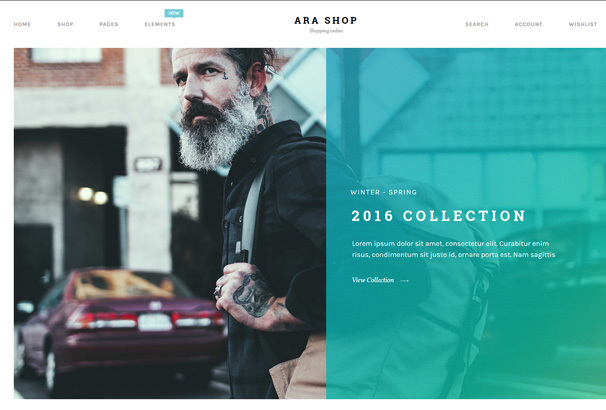 Particularly designed for men’s clothing and accessories, Ara is one of the best multipurpose e-commerce website themes. This theme has impeccable detailing and an overall layout that is stylish to say the least. 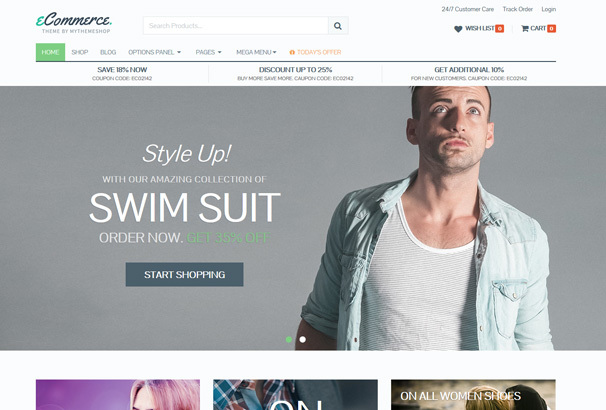 Omega Store is a really responsive and user friendly website theme to suit pretty much all sorts of online stores. With its WooCommerce integration this website theme is really efficient and easy to use. Its cute and simple design is perfect for attracting an audience for your website and is sure to bring in sales and profits. A versatile e-commerce website theme, Omega Store is your complete online store that runs smoothly on all devices. 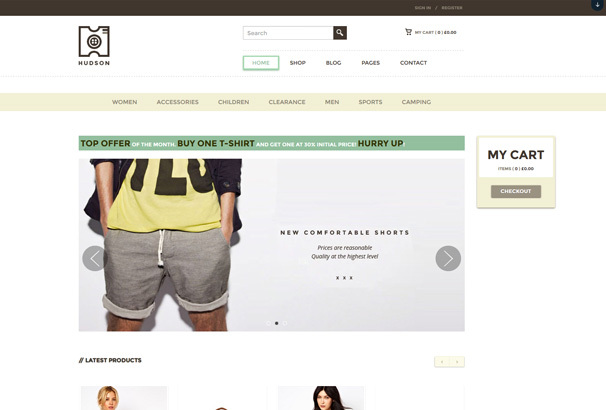 Crop Shop is a really creative and dynamic website theme particularly designed to be used as a fashion website. With its WooCommerce integration you get to build your very own fashion store online. It comes with four layouts for the shop, three for the layout and three for the home page. Owing to its trendy design and amazing features, you get to put your own twist on a custom made website. Delphinus is a really creative and contemporary website theme which is perfect for all sorts of e-commerce websites. A modern and stylish theme, Delphinus has a super intuitive design which lets you create your very own minimal online store. Perfect for a furniture store or for selling pretty much everything, this theme makes the images talk and enhances the appeal of your product. BlackShop is a really unique and creative website theme. With its amazing responsive layout, this theme is super intuitive and easy to use. WooCommerce integrated, BlackShop is built on the cutting edge HTML5 and CSS3 technologies, making it fast and efficient in its functioning. Its trendy design and bold typography makes this theme perfect for all that value style and efficiency. Big Boom has one of the most unique and bold designs. It has a really modern and contemporary colour scheme and a bold font style. With its stylish layout and WooCommerce integration, using Big Boom you get a really versatile and perfect website. 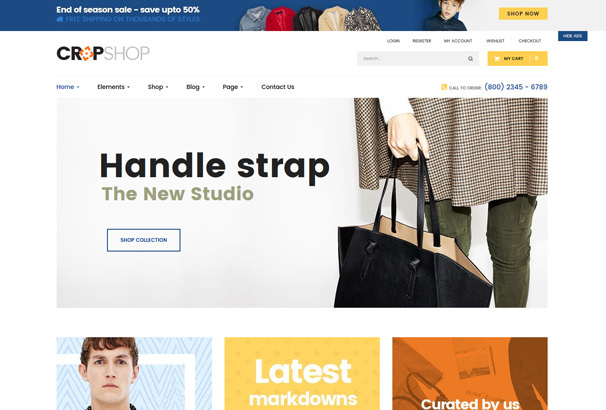 Built on the BooStrap technology and powered by the Visual Composer, this theme helps you create a really powerful and efficient online store. 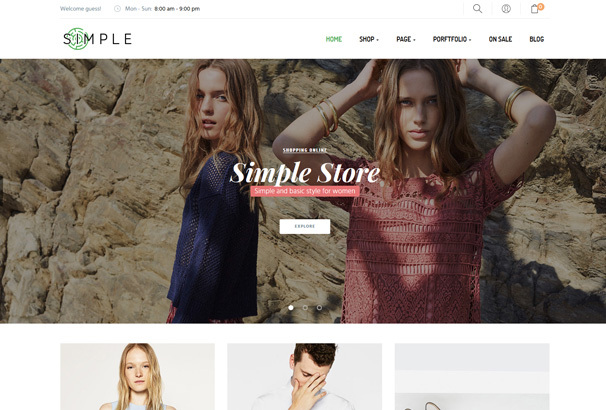 As one can understand from the name, Simple Store is a really simple and elegant website theme. This theme is ideal for all sorts of online stores and provides you with a really beautiful template for your online store. Whether you want to run a clothing store or one for accessories, Simple Store is the most chic and stylish option for you. 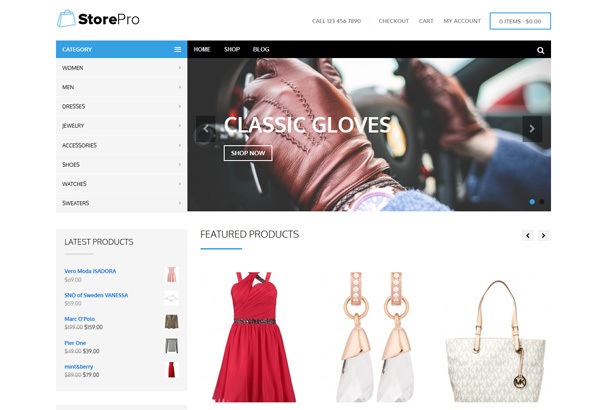 Store Pro is a really simple and stylish e-commerce website theme. 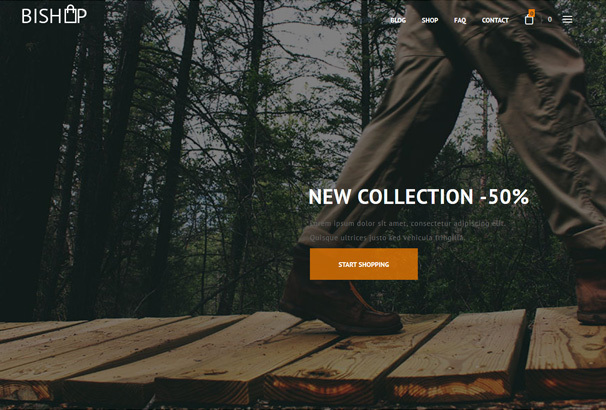 With its WooCommerce integration this website theme is super-efficient and practical. It comes with a huge banner slider on the main home page using which you can promote your products and services directly. In addition to that it also comes with a powerful drag and drop builder using which you can customize the website according to your own preferences. 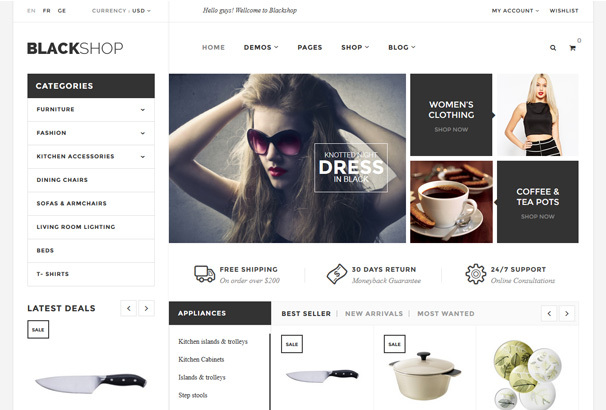 Shophistic is a really creative and modern website theme perfect for any kind of online store. Its appealing design is bound to add to the charm of your products. Not only that its speed and efficiency promises to make not only your website but your products stand out as well. Whether you’re a small business or an established brand, Shophistic is the most amazing theme you can get. Tiny Shop is a really creative and hip website theme. For all the small businesses out there, Tiny Shop lets you create and operate your very own online store for your brand. This is a really customizable website theme that also comes with a variety of custom options. With its powerful drag and drop builder you get to make use of more than 35 strong and efficient elements.